Figure 2 Reactions in humans and other animals known to require cobalamin. mitochondrial. The other reaction is the transmethy-lation of homocysteine by 5-methyl-tetrahydrofolate to methionine, catalyzed by the enzyme methionine synthase (N5-methyltetrahydrofolate:homocysteine methyltransferase) which requires methylcobalamin as coenzyme and is located in the cytosol. It is through their essential roles in this important metabolic reaction that cobalamin and folate interact and are linked with respect to their importance in nutrition. 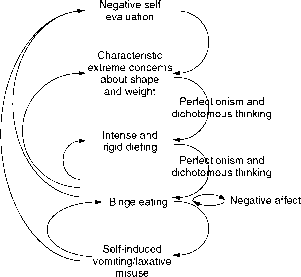 In addition, there are major similarities in the effects of their deficiencies in humans. These will be discussed below. Considering this 'metabolic crossroad' for the two vitamins, it may be pointed out that without adequate supplies of both nutrients, the synthesis of methionine and its derivative S-adenosyl-methionine (SAM) is disrupted, with consequent profound effects on normal cellular function. 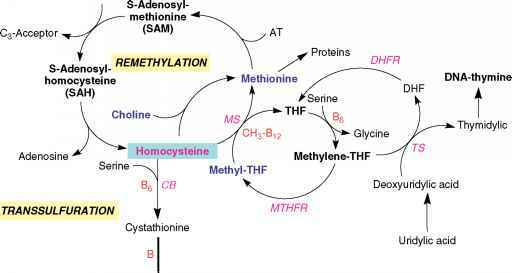 Methionine is a key and essential amino acid and normal supply depends critically on recycling through the remethy-lation pathway (Figure 3). Moreover, SAM is the universal methyl donor, essential for over 100 trans-methylation reactions involving amino acid, nucleo-tide, neurotransmitter, and phospholipid metabolism as well as detoxification reactions. a-Ketobutyrate Figure 3 The remethylation pathway. Cysteine a-Ketobutyrate Figure 3 The remethylation pathway. Cysteine folate congeners are all polyglutamated by an enzyme, folate polyglutamate synthetase, that cannot use methyl-THF as substrate. Tetrahydrofolate is the obligate substrate for polyglutamate addition. 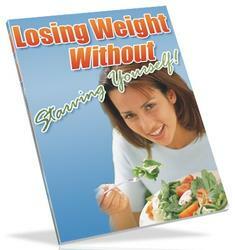 Consequently, when the methionine synthase reaction is blocked as a result of cobalamin deficiency, there is 'THF starvation.' Methyl-THF accumulates in the plasma, while intracellular folate concentrations fall due to failure of formation of the critical intracellular folate polyglutamates because of 'methyl-folate trapping.' This theory explains the abnormalities of folate metabolism that occur in cobalamin deficiency (high concentrations of serum folate, low red cell folate) and also why the anemia that occurs in cobalamin deficiency will temporarily or partially respond to folic acid in large doses. 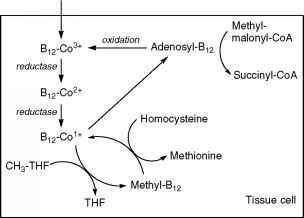 The explanation of why the serum cobalamin falls in folate deficiency may also be related to impairment of the methionine synthase reaction resulting in reduced formation of methylco-balamin, the predominant circulating form of coba-lamin in plasma.